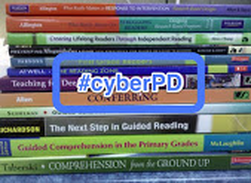 This week is the fourth and final week of #cyberPD, a virtual book study group. The group is reading and discussing Dynamic Teaching for Deeper Reading: Shifting to a Problem-Based Approach by Vicki Vinton. This week we are reading the last two chapters of the book. You can find out more information about #cyberPD here. This week I had to replace the seat on my toilet. 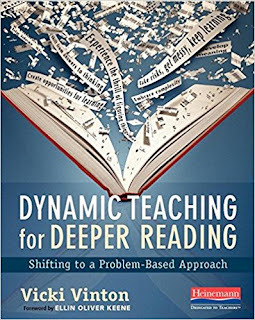 It may sound strange, but after I finished the task my first thought was Vicki Vinton's book, Dynamic Teaching for Deeper Reading. Those of you who have replaced a toilet seat before know that it's not an extremely complex thing to do, but for someone who has never repaired any part of a toilet I was thinking more along the lines of, "How am I going to fix this?" Well, I made my way to Home Depot (twice actually because the first time I bought an oblong seat instead of a round one). I asked a nice Home Depot employee if he thought I would be able to fix the seat myself and he replied with, "Oh, sure, you won't even need any tools." Once at home, with the instructions in hand, I removed the old toilet seat and replaced it with a new-and-improved slow-closing, guaranteed not to loosen version. I stared down at the glistening white, new seat feeling empowered. I had fixed the seat myself. I was presented with a problem and I figured out how to solve it. By myself. With a little encouragement and and an instruction sheet, I learned I could do something, that at first, I didn't think I could do. That brought my thoughts right to Vicki's book. I felt empowered after my success because I fixed the seat myself. Independently. 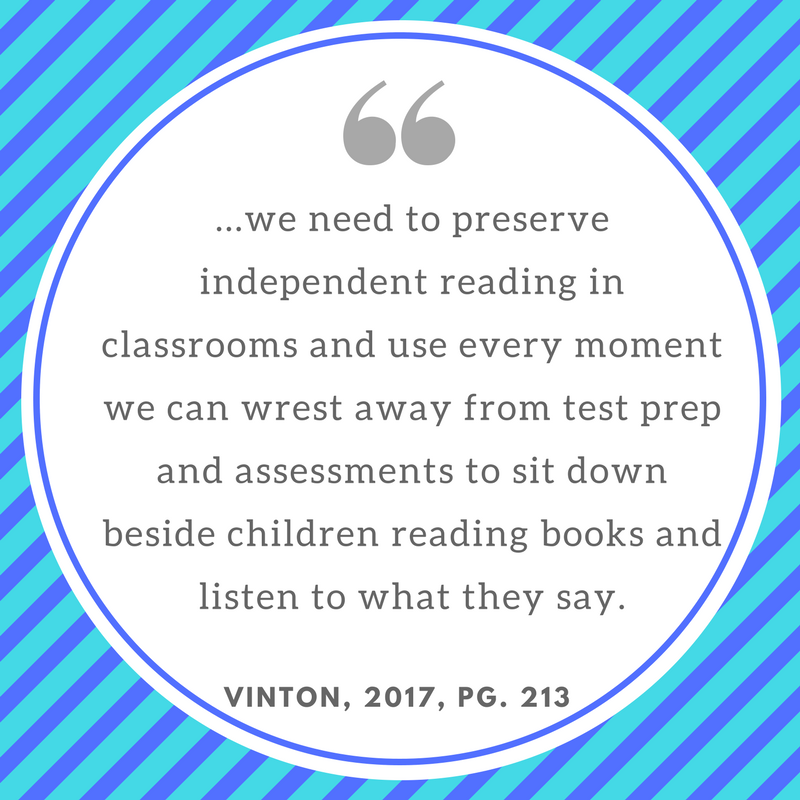 The goal of student independence and the necessity of allowing students to work at solving problems is at the heart of Dynamic Teaching for Deeper Reading. My experience fixing the toilet seat drove home how important it is to help students build a sense of agency, to get them to the point where they think, "I can do this." The last chapter of Vicki's book is all about supporting students during independent reading. She reminds us that conferences are about teaching readers something they can apply in their future reading. In conferences, the teachers role is to support students as they problem-solve for themselves. Vicki describes this process as one of researching. In a conference, a teachers asks open-ended, reader-focused questions to figure out the "how." In order to support readers during a conference, it's important to learn how students are figuring out problems and how they are making meaning. With this knowledge, the teacher can then notice and name what the student is doing and set the student up to problem solve. As students problem-solve independently they are building agency, growing their sense of empowerment as readers. The focus on independence to build students' agency is one of the reasons I have enjoyed reading Dynamic Teaching for Deeper Reading. There are so many useful strategies in the book. This includes new ideas that I can implement and other ideas that will just require a little tweaking of what I already do. I highly recommend the book and will suggest it to colleagues this school year. This week the quote I picked from the book to share is one that highlights what is essential to reading instruction. For teachers to support students in the reading process, they must listen to students as they share their thinking about their reading. And, if we want students to grow as readers, they must be provided with the time to read.